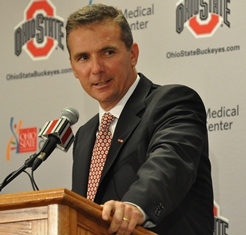 WESTERVILLE, OH – May 10, 2012 –Urban Meyer, the new head coach at The Ohio State University, will be the featured guest speaker at the Third Annual Lauren’s First and Goal Football Camp on Sunday, June 17 at Otterbein University. The one-day football camp for high school players are the primary fundraiser for the Lauren’s First and Goal Foundation, which provides financial support for brain tumor research and cancer services, offers financial and emotional support to families living with pediatric cancer, and increases awareness of the disease. LFG has raised more than $1 million since it was created in 2004. Meyer became the 24th head coach in Buckeye history and returns to collegiate coaching after sitting out the past year to devote time to his family – wife Shelley, college-age daughters Nicole and Gisele and 13-year-old son Nathan – and to work as an analyst for ESPN. Through 10 full seasons as a head coach, Meyer has the tenth-best winning percentage in major college football history with a winning rate of .814 (104-23). He will leap all the way to No. 2 among current major college coaches with that percentage, trailing only the .926 percentage owned by Boise State’s Chris Peterson. Meyer has already won two national championships – in 2006 and 2008 with the University of Florida – and no less than three national coach of the year honors, including The Sporting News honor in 2003 and the Eddie Robinson and Home Depot Coach of the Year awards, respectively, in 2004. Meyer has not only won big at each of his three previous head coaching positions, but he has won immediately. He led Bowling Green to the best turnaround season in the nation in 2001 with an 8-3 record and he went 9-3 in Year 2. He was 22-2 in two seasons at Utah, including a 16-game winning streak and a 12-0 campaign in 2004 when he led the first-ever non-Bowl Championship Season program into a BCS game. He was 65-15 in his six seasons at Florida with the two national titles, two Southeastern Conference championships and three 13-win seasons, including consecutive 13-win seasons in 2008 and 2009 to become the first coach ever to accomplish that feat. And now he brings his coaching talents home to Ohio, the state where he has lived for 25 of his 47 years and where he met his wife, the former Shelley Mather, who grew up in Frankfort, Ohio. The LFG Football Camp is open to student-athletes who will be entering grades 9 through 12 this fall. During the event, athletes are divided into small groups and receive instruction in a variety of offensive and defensive skills from volunteer college coaches from around the country. Walk-up registration for the camp starts on Sunday morning at 7:30 a.m. Minimum donation is $30 and cash only will be accepted. Please print and download a registration form from our camp page of the website and bring with you. Follow the latest camp news on Twitter and Facebook.